On September 18, 1944, the advance party of the Royal Air Force occupied the large, hastily evacuated Luftwaffe base at Eindhoven in Holland. Because it was designed to be a permanent air base, to the delight of the new tenants, it was equipped with brick buildings, well-constructed huts, dispersed taxiways and earthen revetments [soil piled on three sides]. During the following months, the Eindhoven-based pilots were extremely busy with ground support tactical reconnaissance and artillery reconnaissance missions, backing the rapidly advancing Allied ground forces. At this stage of the war, some degree of complacency may have developed among Allied aircrews regarding the Luftwaffe’s ability to mount any meaningful opposition. The German Luftwaffe was starved of fuel, short of aircraft, pilots; morale was at its lowest point. Most of the resistance efforts were, at best, token gestures as Allied fighters virtually owned the skies over war-torn Europe. Our flight crossed the corner of Germany that we had crossed two or three times a day for a couple of months. We had never seen flak there ever before! I got hit. I felt it and I heard it. My No. 2 told me I was losing a lot of oil. I said, ‘Green 3 leaving formation with Green 4.’ I wanted protection so I dragged Green 4 along with me. I made a force landing on the B78 airfield in Eindhoven south of Arnhem in Holland with my wheels down, which was nice since I ran out of engine oil some time before. My wingman, Green 4 went on home. I left my airplane and asked the Royal Air Force Flight sergeant in charge of servicing Spitfires if he could look at my plane. As they were refuelling at the time he said it would be quite a while before he could look at it so I decided to go to the Typhoon Mess. I spent New Year’s Eve with the ‘Tiffy’ boys. I knew a half a dozen or more. I flew with some of them in Canada on the West Coast. As the alcohol was flowing, we rang in the New Year. F/O Gordon Hill climbing aboard his Spitfire. A stroke of luck — his non-starting aircraft — ended up saving Hill’s life on January 1, 1945. The Eindhoven airfield was already a hive of activity on the morning of January 1, 1945 as the squadrons were preparing for their early-morning missions. It was shaping up to be a beautiful day with the cold frosty ground sparkling in bright rays of the morning sun. Apart from the sounds of military activity filling the air, everything appeared delightfully peaceful. It was to be, in hindsight, a spurious peacefulness. Early that same morning, 208 kilometres away at the Gütersloh Luftwaffe airfield in the Westphalia area of Germany, pilots of Jagdeschwader 3 were picked up at their quarters at 0500 hours. After a short breakfast at 0700 hours, the target for the day was finally revealed as Eindhoven. Each pilot had to deliver several attacks and they were to circle the airfield anti-clockwise between each individual attack. No alternative target was given. The pilots received maps on which the course was marked and on which instructions to be followed during flight had been previously inserted. The return flight was to be made from the target on a bearing of approximately 90 degrees, and pilots were told to head for any of the airfields that had been marked on their maps, according to preference. At 0822 hours, the first aircraft took off from Gütersloh as part of Hitler’s Operation Bodenplatte. Over 900 aircraft from various airfields began a massive low-level attack on 16 vulnerable Allied airfields throughout France, Belgium and Holland. My flight was attending a morning church parade when suddenly: cannon shells started hitting the airfield and I found myself on the floor between the altar and the organ. We all crawled onto the floor; then we made our way to the air raid shelter. The Germans were firing the entire time but, fortunately, we didn’t lose any men. After the raid was over, as I was smoking my pipe, a bomb blew up outside the bomb shelter and I bit right through the stem of my pipe. It was a late bomb going off: one of our own! The Germans thought the airmen would have been recovering from celebrating New Year’s Eve. I was standing behind some shelter at the edge of the field. I had finished my tour and I was just waiting to be posted out of the squadron to an aerodrome up near Newcastle to instruct on Typhoons. The squadron was lined up to take off when I saw Messerschmitt 110s and Focke-Wulf 190s come over the horizon one after the other. They shot the hell out of the Typhoons. They circled and went back again. (There was more than one attack.) Our pilots jumped out of the planes and rolled away and looked for a ditch for refuge. A Messerschmitt 262 (jet) was directing the attack. It was circling the airfield at about 5,000 feet. The Messerschmitt and Focke-Wulf were lined up like they were on a game shoot. I saw a number of aircraft making attack on the field and I first thought it was just a German hit-and-run but after the second and third wave passed over, circled and continued their attacks from out the sun, I figured they were playing for keeps. I therefore hurried back to the dispersal area armoury where the Bren guns were kept. There, I saw Flight Sgt McGee and we decided to take a whack at anything flying over the dispersal area. We each took a Bren gun each and two boxes of clips and stood outside the dispersal door and waited for any Jerry that came within range. In all, we believed we fired at 10 or 12 Focke-Wulf 190’s and Messerschmitt 109’s. Strikes was (sic) seen on at least two aircraft. One was coming from the south of us at a height of not more than 40 feet. We both fired a full magazine at him. We saw strikes down the engine in the direction of the cockpit and we saw small bits and pieces fly off. The enemy aircraft flipped over on its other side and we saw black smoke coming from the aircraft. A few days later, a Fw 190 was found some 500 metres southwest of the village of Oirschot, north of the Eindhoven airfield. The Focke-Wulf had been struck by small arms’ fire on the port side and the wounded pilot, Hauptmann Ewald Trost, had been taken prisoner. He had suffered burns to his face and bullet wounds to his right arm. 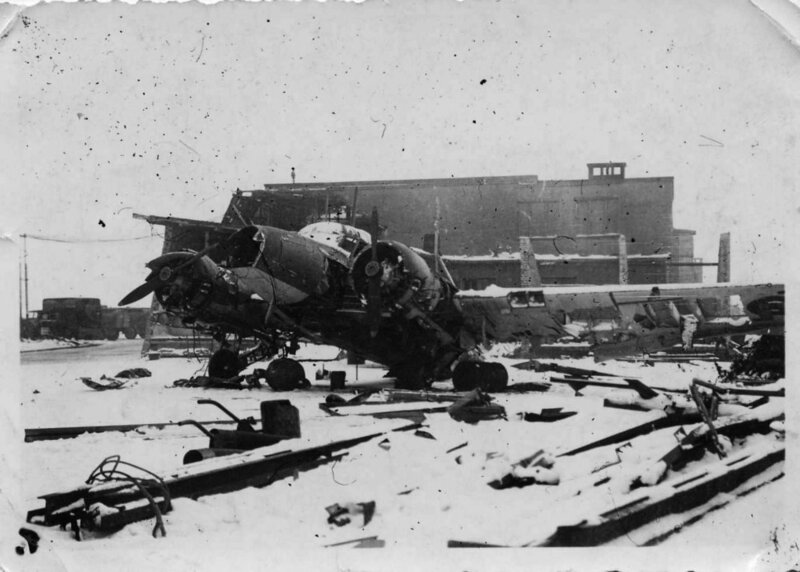 German aircraft shot up our airfield killing at least ten people and injuring many others. Certain selected Allied airfields were attacked simultaneously. Many aircraft lined up on the parkway were strafed and set on fire. Our squadron had four planes on the runway. Flight Lieutenant Pete Wilson, 438 Squadron’s new squadron leader, and his number two had already opened throttles and were heading down the runway when the attack started. Both were killed before they could get off the ground. The German planes were having a ball. A row of Spitfires, lined up wingtip to wingtip, were set on fire. Many Typhoons were victims as well. Other planes parked in revetments fared better. Smoke and flames from burning aircraft were everywhere and must have been hard for Jerry to see what to attack. Our squadron did not get wiped out completely so we were ordered to get a flight in the air to let the Germans know that we were still operational. In stressful times like this, things seem to happen in seconds but we were told later that the attack had lasted 25 minutes. Around 0945 hours, the ordeal for Eindhoven airfield was finally over and the last pilots of Jagdeschwader 3, in small groups or individually, headed for home. Even with their eyes closed, the attackers would have hit something. Next to about 300 aircraft, most of them parked in line, the airfield was filled with vehicles of every type. In addition, fuel and ammo dumps and stocks of all sorts of equipment. Fires started all over the airfield, Typhoons preparing to take off tried to get airborne, while others aborted their take-off; pilots leaping from the aircraft and taking cover. None of those aircraft remained untouched. One of the Typhoons that managed to get airborne shot down a Luftwaffe aircraft but was himself shot down. Only a couple of metres away from us, a courageous Canadian was firing his Sten gun from the end of the runway at the attackers. Besides No. 438, other squadrons were also caught taxiing onto the airfield. Many Typhoons of No. 440 were on the runway ready to take off and received a going over by the attacking fighters. Fortunately, all the pilots survived during the 23 minutes of hell that paralysed everyone. Under the circumstances, their escape unscathed was something of a miracle. While the RAF regiments were trying their best to shoot down the enemy aircraft, fuel and ammunition dumps were set on fire. Thousand-pound bombs exploded every few minutes, individual aircraft were burning in the dispersal area, rockets — possibly slung under the wings of the burning Typhoons — ignited and took off in all directions. Slowly, a thick pall of smoke settled over the area blotting out the early morning sun. The attack had come as a great shock, but it is possible that, after it was over, there may have been a degree of comrades-in-arms admiration that the Luftwaffe could have mounted such a large-scale operation. The attack on Eindhoven can be considered a success. In addition to destroying 26 Typhoons and five Spitfires, the Germans also damaged around 30 more Typhoons. However, German losses had been considerable. Twenty-five per cent of the attacking force of 60 aircraft had been lost and three more damaged. Nine pilots were killed and six ended up as POWs. What documents remain do not accurately record the exact overall tally of the Allied aircraft that were destroyed during Operation Bodenplatte. Estimates of 305 aircraft destroyed and 190 damaged are believed to be much lower than actual loses. Although the Allies could rapidly replace men and material, the Germans could not, especially in pilots. The overall Luftwaffe losses from Bodenplatte totalled more than 250 aircraft and 215 pilots. A catastrophe befell the Luftwaffe the same day. Goring [Commander-in-Chief of the Luftwaffe] had planned a strike by almost a thousand aircraft on the Western frontier against various [enemy] targets. Preparations for Operation ‘Bodenplatte’ were kept strictly secret; nevertheless, the attack was greeted with heavy Allied anti-aircraft fire. On the way back, our aircraft flew over accurate German flak, the batteries not having been informed of the operation on the grounds of secrecy. We suffered heavy losses which could not be made good. ‘Bodenplatte’ was the last major operation undertaken by the Luftwaffe. The only service in the Luftwaffe left capable of offering any effective resistance was the Nachtjagd or night-hunting fighters.